The Wedding Arch can be used as part of the ivory starcloth collection or as a stand alone product. When it comes to the key aspects of your wedding day, such as exchanging vows, entering the reception or cutting the cake, you can accentuate the sheer emotion and exclusivity of these magical moments with our gorgeous ivory starcloth wedding arch. 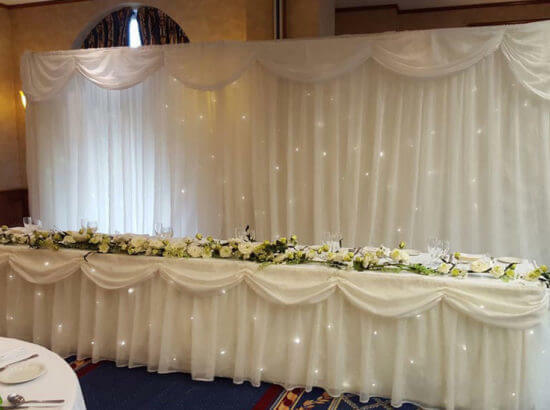 The Premier ivory starcloth arch is perfect to use either at the church ceremony, a civil ceremony or the entrance to the reception venue, and is made by the same manufacturer as the starlight backdrop, ensuring that every aspect of the ceremony and reception have a uniform feel. In addition our ivory starcloth arch is battery operated, meaning you can move it to a location of your choice with ease, doesn’t have any trailing wires, and you can control how bright or dim the lights in the cloth are, as well as how fast or slow you would like them to twinkle. For your safety and peace of mind, the ivory starcloth wedding arch – as with the other matching items – is made from a fire retardant material. To find out more about our ivory starcloth wedding arch, or to book one for your wedding reception, get in touch with our friendly team. We look forward to hearing from you.